We got up at 04:40 this morning - hopefully1 - and we've already arrived on Ishigaki island in Okinawa as you read this. We're probably taking a walk around town, looking for lunch and getting a few last-minute things before we take the ferry to nearby Taketomi island where we'll stay for the next couple of nights. No summer vacation is complete without a shady spot, a glass of beer and a paperback. I feel fully confident in Okinawas ability to supply the shade and the beer (Orion is pretty good), but a paperback I have to actually pick out and bring myself. I'm starting on "Kasha" by Miabe Miyuki; I read her "Riyuu" a couple of years ago, and found it very difficult, but impossible to put down. Now, my Japanese has progressed since then, and Kasha is supposedly an easier read, but Riyuu took me a year, and I expect Kasha will take me months at least. More so now that I read the morning paper on the train, with less time for a novel. Paperbacks aren't the most resilient of things, and they tend to fall apart when you tote them around in a bag for weeks and months. A book cover is a good way to protect the deathless prose, and not just from wear and tear but also from prying eyes; you can leave your fellow commuters guessing whether that thick volume is Harry Potter or Finnegan's Wake (as if there's any doubt, cover or not). Kasha, by Miyubi Miyake, and a smallish furoshiki (about 45x45 cm I think). I got this in Kyoto; I like how the two sides are printed in different colors. Any somewhat thick and stiff cloth would do - a cotton sheet might be a little too soft and flimsy to stay in shape, while starched cloth or oilcloth would probably make a very durable cover. 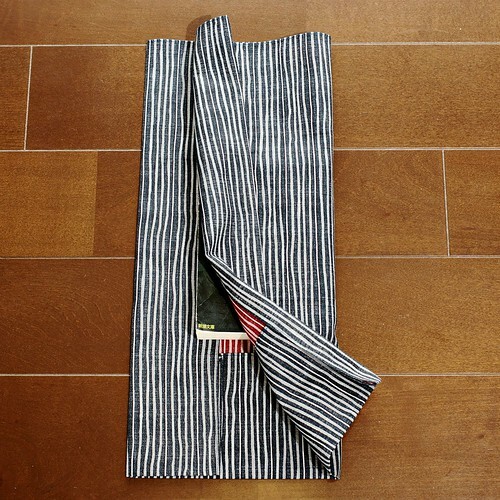 I like furoshiki, those all-purpose squares of cloth you can use to wrap and carry things in. I wrap my lighting stuff in a large blue furoshiki that doubles as a great backdrop. 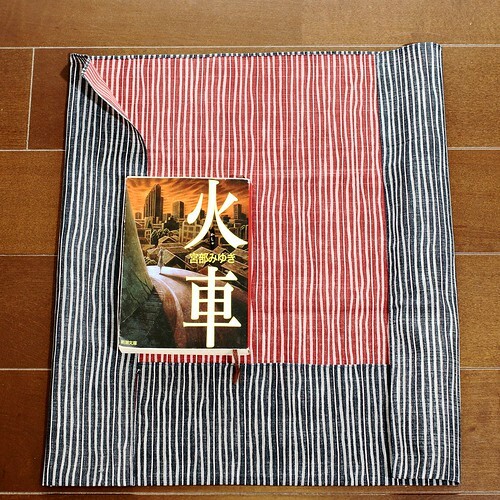 A small furoshiki makes a great book cover. 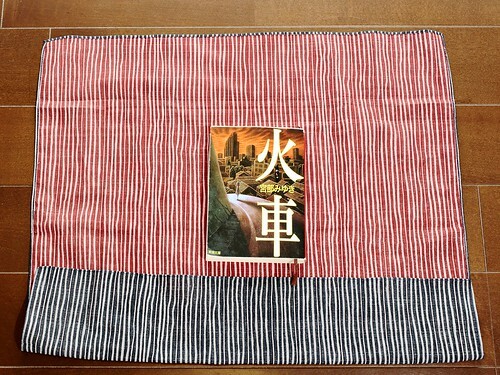 I saw this book cover idea explained in the store I got the furoshiki, and added a step to make the cover show only one side of the cloth. 1) Put the cloth, back side up (our cover will show the blue side) on a flat surface. The vertical size of the cloth needs to be a bit less than three times the vertical size of the book - 2.5 to 2.8 times or so. So, we fold up the bottom edge to make it the right size. You can just fold by hand - especially when you practice - but I like to actually iron each fold to make the cover solid and tight-fitting. 2) Now, the width of the cloth needs to be enough for the entire cover - both sides and the spine - plus at least 4-5cm but less than the side width, for each side. The cloth here is a bit too wide for this book, so we'll fold it to size. Find where the book will lie in the center of the cloth (fold the cloth in half and place the book in the center, then fold back). 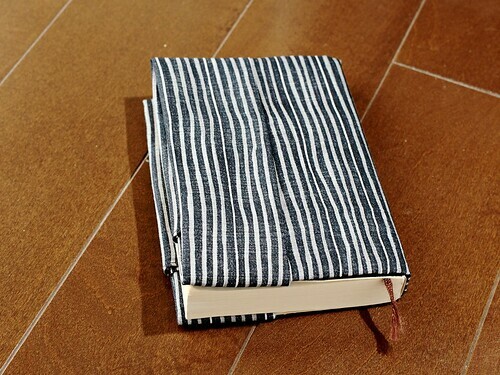 We fold in each side enough so that the edge of the cloth - one cm or so at least - will end up under the book itself. 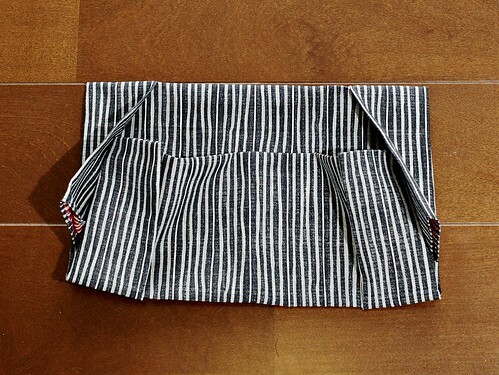 Do one side by eye, then measure how much you folded and fold the same amount on the other side. This extra fold will make the book cover an even color. If your cloth is not wide enough to do this, then don't worry and just skip this step. The front part of the cover will show the opposite side of the cloth. If the cloth is the same color on both sides it won't matter at all, and contrasting colors can make for a cool effect. 3) Here's the tricky fold. 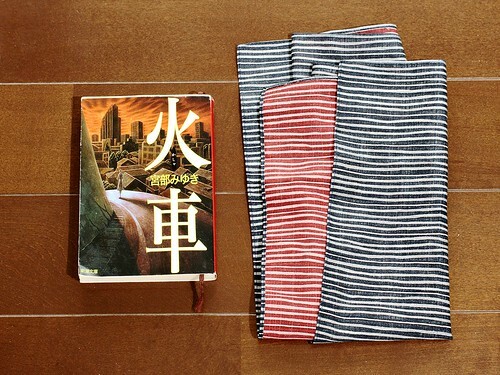 Put the book in the center with the cloth folded over it. Then fold back the overhanging cloth on each side back over the book. The edge of each fold should not be flush with the book edge, but should stick out just a few mm - 3-6mm or so - from the edge of the book. How is this tricky? The amount it needs to stick out depends on the cloth you use, how firmly you want to book to rest in the cover, the thickness of the book bindings, how tightly you do your folds and other things. If it sticks out a lot the cover will be loose. If it sticks out too little, the book won't fit. You may need to redo this a few times to get it just right. You might also want to make this just a little crooked, with the bottom slightly narrower than the top, to make step 6 easier. Oh, and the extra bit of cloth tucked under the book in step 2 tends to want to slip out, so this is one fold you might want to iron or press firmly. You can use a couple of paperclips to keep it in place until step 5 if you want. If you never did step 2 you don't need to worry about this of course. 4) Now for the vertical folds. Use the book as a measure to fold the top part down. The top part you fold down should not reach all the way down to the bottom edge of the book. Instead, make the part you fold down and the part that is left below the bottom edge of the book about equal in size. Since we made the vertical size a bit less than three times the book height in step 1, this will give you a bit of free space between the folded down top edge and the bottom edge of the book. This is good. 5) Fold up the bottom part to match the book bottom edge. 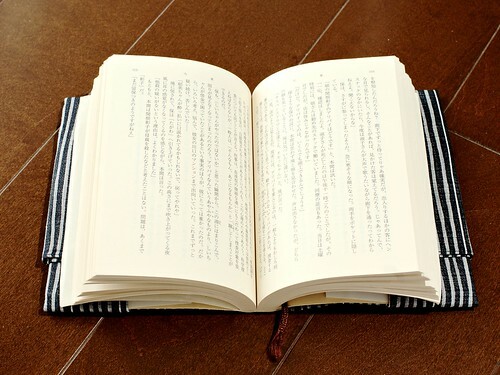 You might want to leave just a mm or two of extra vertical space to make it easy to insert the book. 6) Tuck in the corners from the latest fold under the tabs from the previous fold. Getting this all nice and flat can be a little fiddly. The topmost part of the top fold may be a little wide so you get some extra cloth with nowhere to go. You can sort of adjust the horizontal folds in step 3 a little to account for this (make it ever so slightly narrower toward the bottom), or just iron the extra cloth into a crease; it won't be visible anyhow. 7) Now, slide the book binding into the pockets created by the previous folds on each side. If you got the tricky fold in step 3 right, the book should fit perfectly. If it's too tight the book won't close properly; with too much margin it'll be a little loose. The vertical folds may need adjusting too, though that's much easier. If it fits well you may want to remove the book and iron the cover flat, to make it really smooth and tight. We're done! Neat and tidy, and it protects the book surprisingly well. The cloth is thickest around the front edge and corners that need the most protection. The cloth will soak up light spills and will keep grime, breadcrumbs, marmalade and other stuff from the book. 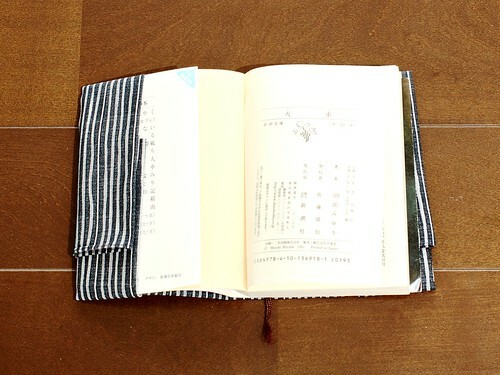 The front-facing folds make pockets where you can tuck in a pencil or a small notebook2. And when you're done with the book you simply wash the cloth and reuse for the next one. 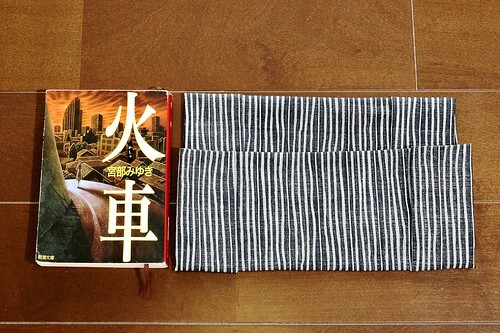 A furoshiki this size will do anything from a small paperback up to a large hardcover. #1 I remember a time, not that many years ago, when four-thirty was still the night before, not the morning after. I'm getting old I guess. This is handy! I bought a cloth like that a couple of years ago, so this will be useful. The cloth I have is a bit shiny though. I was always worried it would slip out of the knots and open up. The instruction book I got with it only had different "bag like" things you could make. 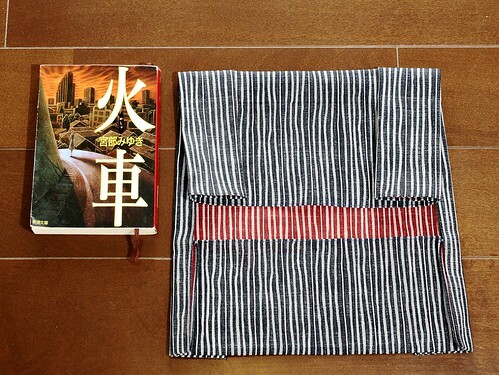 Just remember that you can't do this with a full-size furoshiki (unless you're using it for a really big book). Shininess and slipperiness shouldn't be too much of a problem; it's easy to use a few paperclips to invisibly keep the thing in shape and hold the book in place if you need it.